Still spending a lot of time thinking about witches, wizards, schools of magic and witch queens. So naturally my thoughts turn to +Bruce Heard's masterpiece, GAZ3 The Principalities of Glantri. I have mentioned Glantri here a few times. It was the homeland for my characters back in my D&D/AD&D days. I built up the country from the small bits of information from D&D Expert Set, Isle of Dread and Castle Amber. 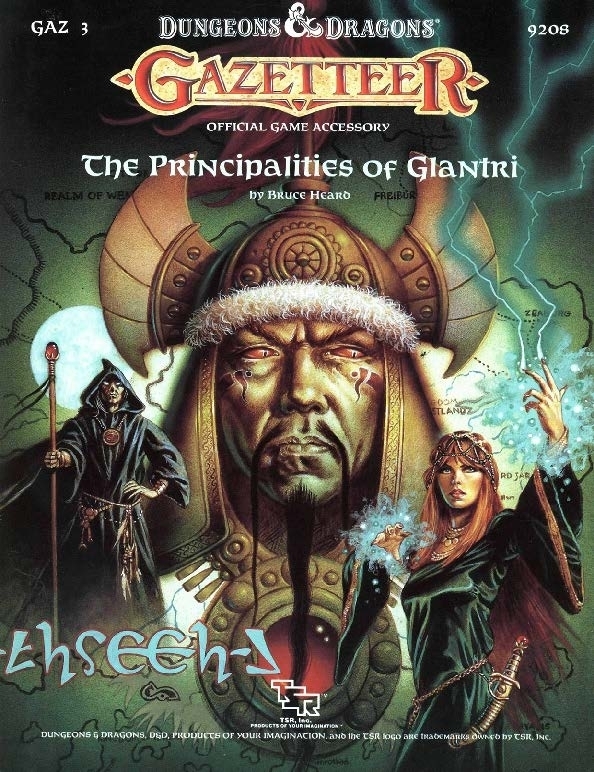 It was not till much later I discovered the Gazetteer series and picked up Glantri that I discovered how really interesting and fun the place was. The pdf is 102 pages (the original book was 96 pages, a detached cover and large map of the country and Glantri City). The PDF is a good quality scan and retains all the information found in the print book. The cover art was done by the fantastic Clyde Caldwell. While this book is a D&D "Basic" book, there is so much here of use that it can really be used with any D&D system. This book really set the stage for all the other Gazetteers to follow. The first part, Welcome to Glantri, gives a very brief overview of what the country is and what this book sets out to do. Up next is the History of Glantri. I spent hours and hours reading this over and over. I won't go into great detail, but linking Glantri to ancient Blackmoor was wonderful in my mind. Mostly because I loved the link but also I had done something similar for my own games. What follows next is a time line from 3000 BC, The Rain of Fire* (Before Crowning of the first Emperor of Thyatis) to 1000 AC (today) and even on to 1200 AC. *I always wondered if the Rain of Fire that destroyed Blackmoor was related or even just the same spell that destroyed the Suel in the Greyhawk world. Geography of Glantri is next. Like much of Mystara, Glantri is a mix of all sorts of races and people, but Glantri also has it's fair share of "monsters" those will be detailed later. Glantri's climate is also touched upon, making it one of the colder lands. The is followed by The Glantrian Economy. I really enjoyed this section because it really breathes life into the people that live here. Each of the Principalities is detailed here for the first time. A quick read and one immediately recognizes analogues to Scotland, Italy, France, and even Transylvania. Glantri is very cosmopolitan. We move into the Grand Army of Glantri and Politics and Rivalries of Glantri. Glantri is the place to play out political intrigue where everyone is mage of some sort or has one on retainer. Like the Economy section, this section breathes more life into the people of the land, in this case all the great houses. I will admit once again that the interior art by Stephan Fabian links this to Ravenloft in my mind. Not only are there humans here, but vampires, werewolves and liches ruling. We will get to witches in a bit. Guilds and Brotherhoods are also one of the more important features of this book and life in Glantri. There are so many here that characters could each belong to many and none overlap. Some are complimentary to each other and others at cross purposes. Really good fodder for role-playing. Glantri City by Night details what happens to the 39,000+ residents when the sun goes down. The book is like a what we now call Modern Supernatural. So all sorts of "monsters" come out and mingle with everyday people. It says "by Night" but really this an overview of the city itself and all it's sections. It reminds me of a travel guide to London I once read, so I am rather fond of this section. Living in Glantri City details life in the city including the laws, who is in charge, magic use and various holy/high days. There is no religion in Glantri, but there is a state philosophy. Of course it is tied in with magic. The Great School of Magic. Outside of Hogwarts or Professor Xavier's school has a school been so rich detailed. Though there is enough here to make me want more, a lot more. This is followed by Creating Spells and Magical Items and The Secret of the Radiance. The source of Glantri's magical power. Nest we get into The Seven Secret Crafts of Glantri. If you only buy this book for this section then you will be well rewarded. Think of these as schools or even colleges of magic. Each one ads something special to the Magic-User class, almost like a Prestige Class or Paragon class feature. They include, Alchemy, Dragon magic, Elemental magic, Illusion, Necromancy, Rune magic, and of course, Witchcraft. We wrap up with Adventures in Glantri. The Gazetteer series were works of art and none more so than the Glantri book. I mentioned before that this book would work fine with other versions of D&D. 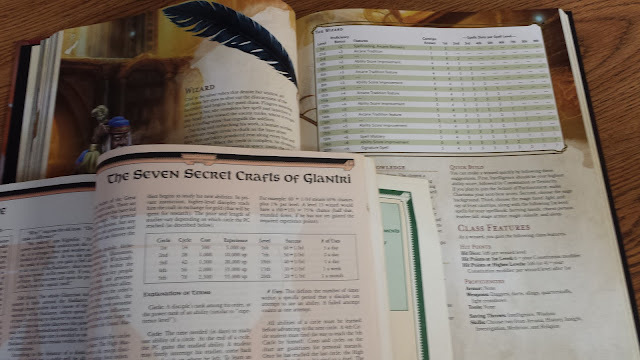 Looking deeper into the Seven Secret Crafts of Glantri, one could EASILY replace the Arcane Tradition feature of the 5th Edition Wizard and replace those powers with the craft powers. The 5e wizard gets 4 Arcane tradition powers/features and the Basic craft wizards get 5. They work out to about the same levels too. So if you have not picked this up, do so. I highly recommend it. I also recommend Bruce Heard's latest Calidar kickstarter Beyond the Skies. Calidar is a load of fun and this promises to be great. I've owned Glantri for years, and used it a bit back in the days I was high on BECMI/RC play. However, there's a lot of it that feels very anti-D&D to me. 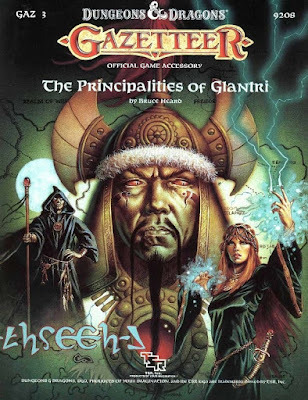 It's nearly an alternative rule set/variation and campaign setting for, well, "Hogwarts-style" play (and though it preceded Harry Potter in MY life, much of the gripes I had with the latter...making magic mundane, for example...were first complaints I had about Glantri). So, yeah, the secret crafts are cool and some of the new mechanics, and it's nice there's an actual working cosmology of magic (even if it's one I dislike), but it's not a set I'd strongly endorse. Yes, I realize this is YOUR blog, not mine. BTW, been thinking a lot about your recent magic-user "gripe post," and how one might build a better MU, and maybe something like the Secret Crafts would be a good seed kernel for such a project. I've always dug the rival schools/cults concept when it comes to wizardry. Well I like to thnk I encourage discussion even disagreement! Yeah, there is a bit of Anti-D&D in it, I won't deny that. It's more political intrigue and adventures in one place. It's more who is in what secret alliance with who and less kicking in doors. But that is the style of play I was digging on in the later 80s and 90s. No suprise then that I turned over to games like Vampire and WitchCraft eventually. I have part 2 of my wizards post today where I mention some Glantri Secret Crafts.